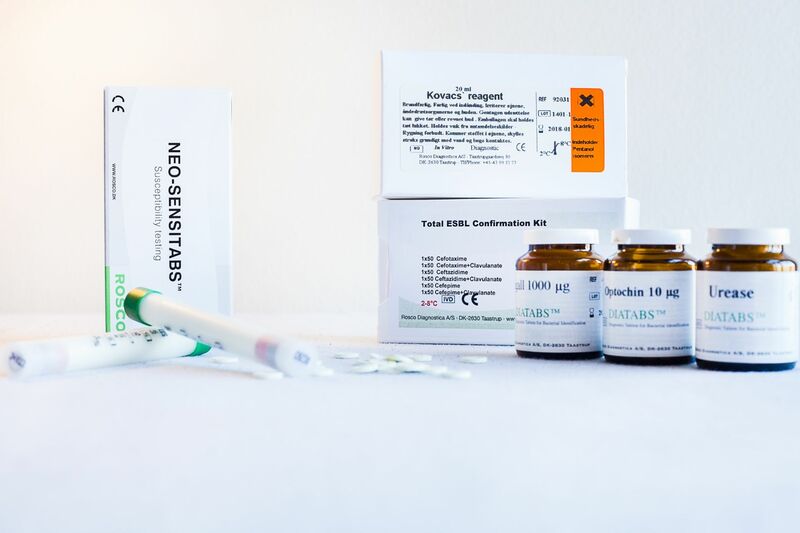 The kits are complete with ready-to-use cartridges of the necessary combined Neo-Sensitabs™ or Diatabs™ and a guide to their use. The capability to detect ESBLs, AmpC and carbapenemases (KPC and metallo-â-lactamases) in the laboratory is important to improve the clinical management of infections. Disk (tablet) approximation tests detecting synergy (or antagonism) are useful to screen and detect the mentioned beta-lactamases. The combination of non-susceptibility to carbapenems with synergism between Phenylboronic Acid and a carbapenem are indicative of KPC beta-lactamase. ROSCO Diagnostica acknowledges the increasing need for detecting mechanisms of resistance and is focusing its research activities in this field. 98018 - Detection of COLISTIN resistance in Enterobacteriaceae, P. aeruginosa and Acinetobacter spp.